Soundproof Cow lives and breathes (and “moo”s) acoustic panels, which is why we carry a wide selection of top acoustical brands, like Quiet Board™. Our water resistant acoustic panels are made with the highest quality materials so you can soundproof any room or space for years to come. Made with a Styrofoam-type material, water-resistant acoustic panels are scientifically designed to absorb sound, meaning what sound goes in, doesn’t come out. 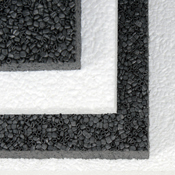 And because Styrofoam is a highly durable material, it’s perfect for water-resistant acoustic panels. 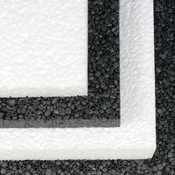 These resilient panels are effective for a wide variety of uses and applications. Animal shelter soundproofing is a big issue. A large number of animals in a small space can make a tremendous amount of noise, and soundproofing is key to keeping that noise level down. When it comes to feeding and watering time though, things can get wet and messy, which is why this is a great place to have water resistant sound proofing. An indoor pool is another place where things can get loud, especially if it’s loaded with kids — and it’s clear to see why it’s critical to indoor pool soundproofing that any echo reducing panels be water resistant. That’s what makes Quiet Board Water Resistant Panels ideal for indoor pool soundproofing. Skating rinks aren’t necessarily wet, but the condensation rising from the ice could potentially damage some soundproofing panels. Not Quiet Board Water Resistant Panels, though. Install some of these echo reducing panels in your skating rink and enjoy vastly improved acoustics without fear of water damage. There are few places that get as loud as a gun range, even if you’re not in close proximity to the shooting. Quality soundproofing is critical, which is why a gun range is a great place for liberal placement of Quiet Board Water Resistant Panels. If there’s a business that’s equal parts wet and loud, it’s a car wash, which is why Quiet Board Water Resistant Panels and car washes are a perfect match when it comes to soundproofing. Food preparation areas can get pretty hectic, with expediters screaming orders, cooks screaming instructions and hungry people nearby just screaming. Good soundproofing cuts down on noise pollution and helps the people who need to hear each other communicate — and with Quiet Board Water Resistant Panels, you don’t have to worry about any stray flying foodstuffs damaging the soundproofing. Different laboratories function in different ways, but most require that the scientists within be able to communicate clearly, which means extraneous sound needs to be kept down. Just what these acoustic panels specialize in. The ceiling is often neglected when it comes to soundproofing, but a significant amount of sound can come through it, which is why it’s important to have acoustic panels up there as well. If your ceiling is directly under the roof, or under the floor of someone who’s no stranger to water leaks and spills, having these panels be water resistant can provide a good deal of peace of mind. Arenas and stadiums probably get as loud as a place can get with all those screaming fans, so it’s a great spot for high-quality soundproofing. With Quiet Board Water Resistant Panels in place, stadium managers can enjoy improved acoustics without worrying about damage from flying beer or soda launched by overexcited fans. Gyms can get loud, especially when they’re full of people looking to get in their workout. Good soundproofing allows trainers and spotters to communicate safely and effectively with the people they’re working with. Lining a rooftop enclosure with acoustic panels is a great way to control unwanted sound. Since rooftop enclosures are more susceptible to the elements than most spaces, often water resistant panels such as the Quiet Board acoustic panels are an absolute must.